J: There’s a lot that can be said for Osborne Road, the Jesmond street popular with just about anyone who enjoys a good night out or a good lunch. With its many fantastic bars, hotels and restaurants, it can sometimes be easy to overlook new venues and menus in favour of an old favourite, or a place that’s close to where you finally found a parking space. One restaurant however, that doesn’t deserve to be overlooked is Sohe. J: Sohe is a pan Asian inspired restaurant and cocktail bar that serves a variety of Asian dishes along with some fabulously delicious and uniquely flavoured cocktails. 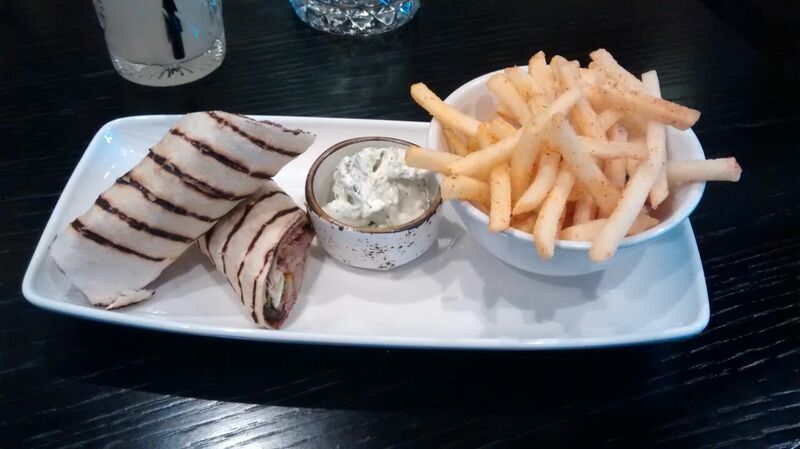 Recently, Sohe released their new lunch menu, a two course meal for £8.90, featuring a starter and a main course. 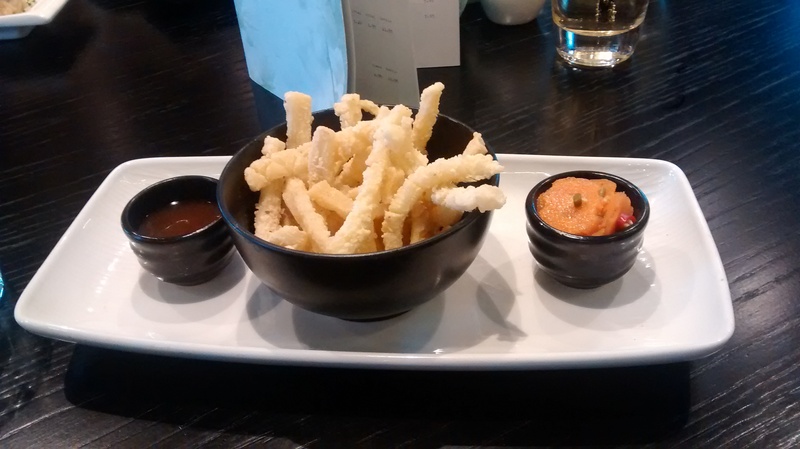 J: To start I opted for the crispy salt and pepper squid chips with plum and tamarind dip. Usually in any cheap and cheerful Italian I always go straight for the squid rings, and so I wasn’t surprised when I found myself ordering a squid starter. The squid chips were a nice change from the usual squid ring, the batter seasoned well and the shape made it really easy to dip into the tasty plum and tamarind sauce. C: I rarely turn down the chance to eat duck when eating Asian food and it was no different for starters. I enjoyed the Duck & Chive Sui Mai. 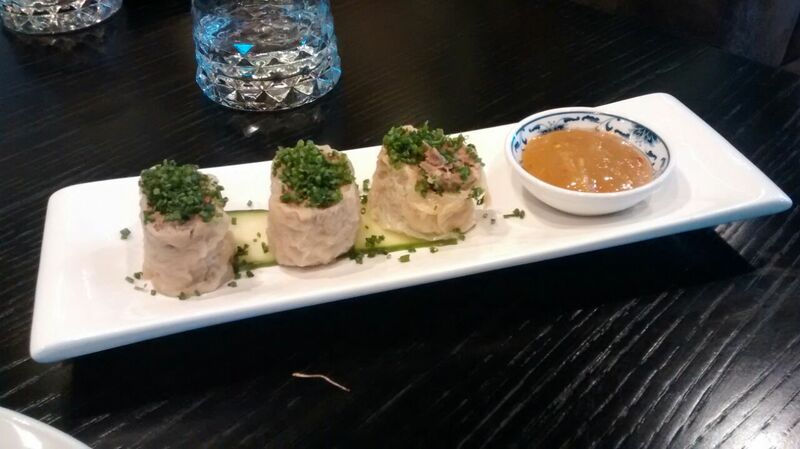 Although delicate, these rolls were packed full of shredded duck and the chives gave it just the right hit. I was also pleased to find more than enough mango sauce to satisfy my dipping needs! As far as first impressions go Sohe got it right. I almost felt I was dining far above my 8.90 lunch budget. In need of a quick drink before the mains arrived I searched the cocktails/mocktails. One needs only to glance at the ingredients to see what a diverse selection is on offer. I opted for the ‘Old Hanoi’ as it reunited me with the Szechuan pepper. An old friend of mine from my travels in China. I felt utterly refreshed. 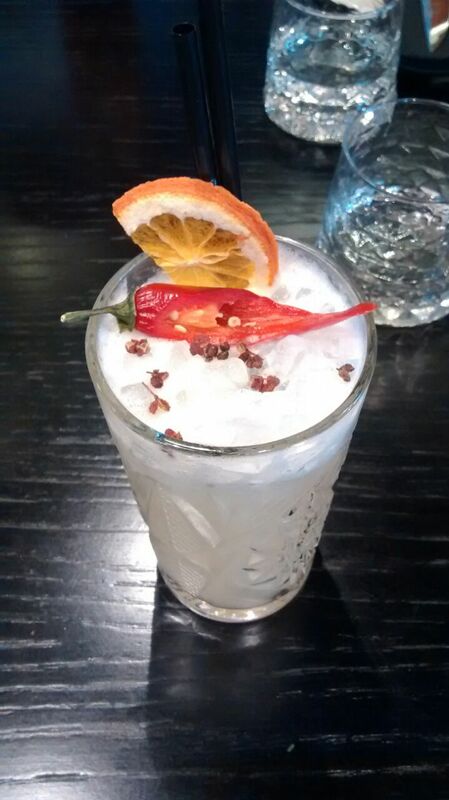 The pepper and chilli provided an exciting blend of flavours without an uncomfortable heat. At this point I was so relaxed I considered cancelling all my evening plans to soak up more of Sohe’s unique atmosphere. 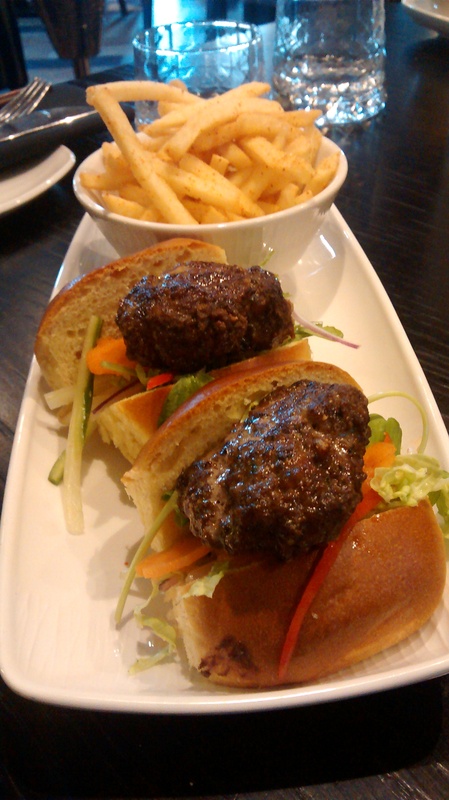 J: Following my seafood starter I tucked in to two Teriyaki glazed beef patties in a brioche bun (I’m a sucker for a good brioche bun). The teriyaki flavour itself was subtle, but the patties were cooked very well; still juicy while keeping the beef tender. I think most people who eat meat can agree that beef cooked for too long is just not right, and thankfully Sohe understands this too. During the course of my meal, I thought I could handle two slider sized patties with ease, but they were actually deceptively filling which surprised me. C: When the mains arrived however I soon snapped out of my daydream. I admit at first glance I wondered if they would fill me however by the end that was no concern of mine. For my choice of Banh Mi: Japanese breaded pork in a flatbread roll. Again I wasn’t disappointed and found my rolls densely packed to capacity. The pork was tender and the pate added enough moisture to quell any fears of a dry main! However, a mention must be made of the coriander labneh. It was the perfect companion to my chips. I will never look at BBQ sauce or ketchup in the same way ever again. 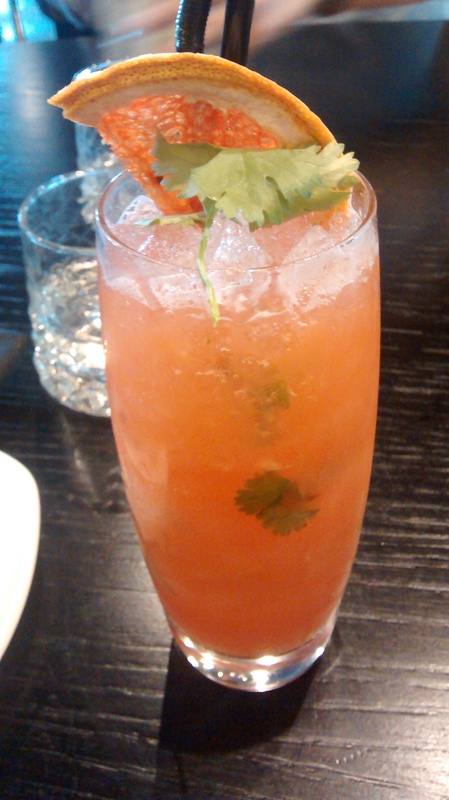 J: Sohe is known for its cocktails as much as its food, so to accompany my meal I ordered a “Bittersweet Symphony” mocktail – a sharp and refreshing grapefruit-based drink. It was delicious. 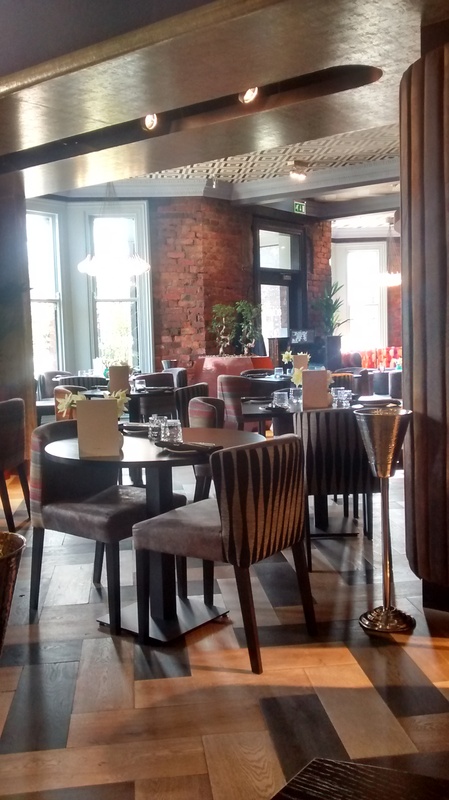 J: If you’re in the Jesmond area for a lunch date or you’re in need of a place for a business lunch, then I recommend giving Sohe a go. 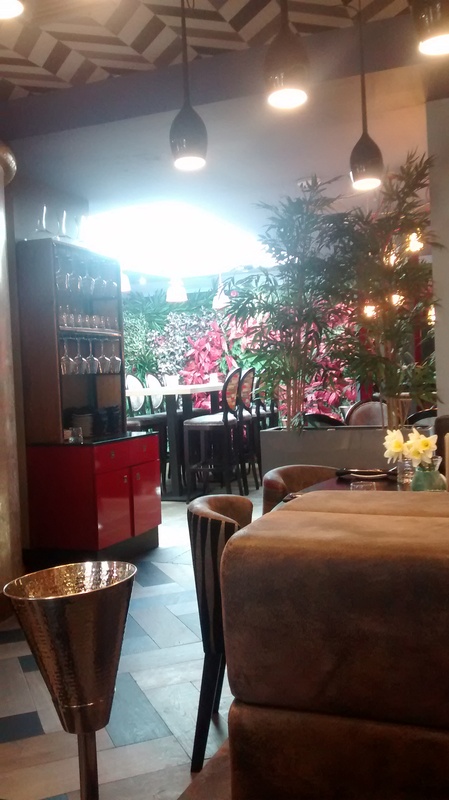 The atmosphere is modern and relaxed, the service is great and both the venue and food are impressive. C: Overall I say Sohe is providing stiff competition for lunch menus here in the north east. Great, value great atmosphere and incredibly friendly staff have me penciling in my next appointment! Find them on Facebook and Twitter too! We’re heading there for lunch tomorrow and you’ve definitely given me some ideas of what to pick! Yum!! I hope you enjoy it! Can’t wait to read your post about it! Two courses for £8.90 is a real bargain – do you think they are child friendly?